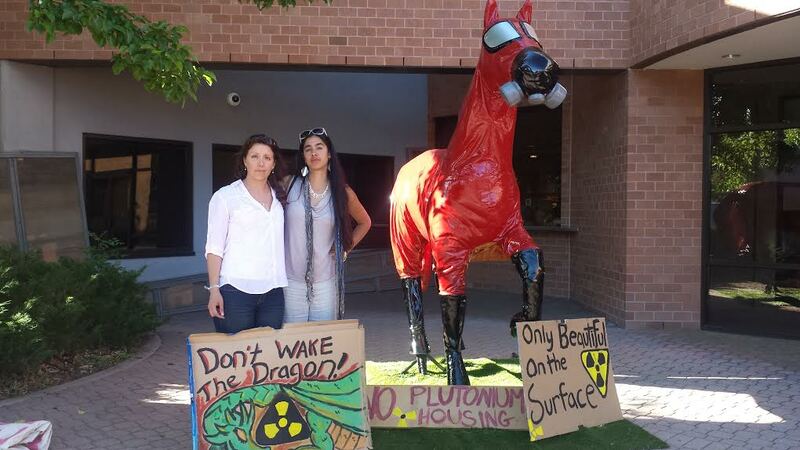 Founded in 2013, our focus remains on raising awareness of the ongoing radioactive dangers at Rocky Flats, while advocating for active and responsible stewardship of the site and the surrounding areas. Candelas Glows/Rocky Flats Glows seeks to keep the memory of the site’s history alive while advocating for the open acknowledgment of the hazards still present. They remain committed to working to inform communities both near Rocky Flats and beyond, of risks the site poses to human health, as well as working with local and federal government agencies and officials. In the tradition of nuclear guardianship, we look to memorialize the site, while honoring workers who put their lives on the line when the plant was in operation; and acknowledge the residents in the area who have suffered from the contamination of the site. We hope to convert Rocky Flats from a refuge and recreation area to sacrifice zone that remains closed for the safety and protection of current and future residents and Colorado visitors. We became involved after learning about Candelas, one of Colorado’s largest new suburban developments, and its part of an alarming trend of forgetting about its neighbor, Rocky Flats– a former Nuclear Weapons Plant & now an active Department of Energy (DOE) managed Superfund site. When the Rocky Flats weapons plant was in operation, it built plutonium triggers or ‘pits’ for over 70,000 nuclear bombs. The area in and around the former Nuclear Weapons Plant site has been contaminated with plutonium, uranium, americium, beryllium, and, according to the Department of Labor, over 1,000 other carcinogenic chemicals. Our work is about raising awareness about the history of the site and all the developments in the area, from housing, schools and malls, to toll-roads, visitor centers and trails. Let’s put public health 1st. So this is not just about Candelas. We believe Rocky Flats needs to be remembered for what it is with plant workers recognized as the veterans they are. The “Wildlife Refuge” designation needs to be immediately stripped and NOT opened to the public for recreation. We believe the site should be memorialized, calling on artists to help us build permanent structures that speak to the site’s past much the way other historical tragedies are memorialized. A memorial could also commemorate the workers and neighbors who have been deeply impacted by the legacy of the site. Optimally, an institution would be created to oversee Rocky Flats and ensure its troubled history is remembered. Particularly in times of natural disasters, we believe someone should be watching Rocky Flats and mediating natural disasters as they arise. Originally we were concerned about the very likely scenario of drought and dust-bowls at Rocky Flats, and the 2013 “1,000-year flood” at the site renews our concern that if drastic scenarios and emergencies arise, there needs to be an impartial group of people that can warn neighbors downwind and downstream. The institute could also do continued testing and initiate long-term testing on radioactivity remediation, focusing on natural solutions. Note, some of that mission has been handed to the Rocky Flats Stewardship Council, but unfortunately, it is largely comprised of governmental stakeholders with financial interests in development of the area around Rocky Flats. Contact us: candelasglows@gmail.com or alesya@Rockyflatsglows.com. This exact type of development covering over superfund sites with a few feet of clean soils or mixing clean and contaminated soils to dilute levels of contamination for sampling analysis has been taking place all over metro Denver for 30 + years. They build commercial development over most and what they don’t cover with building footprint the install huge asphalt lots. They have moved to residential development in the last 15 or so years building huge beautiful naborhoods with parks and community shoping… As we older generations pass the memories of what is buried beneath these places will be forgotten but the deformities and cancer rates will stay on the rise but those who suffer will know not why – because our corrupt government and greedy developers will not disclose the real truth. It’s pretty simple people – the developer hires a consulting firm to perform an environmental assessment on the property they wish to purchase for redeveloping, the consultant comes up with a complete history of the property and adjacent properties as well as any possible sources of contamination. The provide selective sampling and put together what’s called a “phase 1 environmental assessment”. So the phase one will support the government’s sale of these “contaminated superfund sites at a reduced price to developers with “stipulations” attached to the purchase to clean up the site to “EPA Standards” prior to development of the properties. So to make a book into a short story these development groups are made up of Politicians, environmental consultants, and developers who pay each other to make the entire process look clean and legal, when all they actually did was cover over the ugly scars our government created with beautiful new buildings and grass and roads, and parks so the public perceptions of the area is hanged and the problem forgotten. The most damdable part is the public pays for the entire process in purchasing these bottom dollar properties for premium dollars upon completion of the bandaid development… Please do not use my name if you repost this as I could be in harm’s way as a result. Thank you for your comments, Anon! It is infuriating and scaring what is happening over there and we hope we can preserve some of the stories of people like you, so that the truth and history of Rocky Flats is not forgotten. Keep sharing your opinions and knowledge of the site! I was an environmental consultant on Rocky Flats, a decade or more after the initial phase one. And while the Anon reply has a lot of truth many consultants and in my case former consultants are actually in it to make places safer. Money becomes the bottom line, strict underfunded budgets tend to govern phase one plans. Additionally it becomes a problem as to where to put contaminated soils, many other areas don’t want it. Disturbing that much contamination is also a risk factor, which doesn’t mean it shouldn’t be done. When you sink your teeth into the projects it is easy to get discouraged as often your bumping up against one govt entity v another. I’ve worked quite a few of the nuclear waste and test sites in the western US. If I can help your effort as a volunteer w experience (Geology, groundwater, surface water, as well as advisory roles on the closure and apres closure processes) please contact me: pinnaclehousecleaner@gmail.com. That’s right I’ve moved out of environmental cleanup for pay and into housekeeping as that can be accomplished in a day. Thank you for standing up for your community.